The Escapist Has a Booth at New York Comic Con! Stop by The Escapist's Booth #1583 at New York Comic Con to meet some of your favorite Escapist stars and win some prizes! New York Comic Con is the East Coast's biggest and most exciting pop culture convention, featuring the latest and greatest in comics, graphic novels, anime, manga, videogames, toys, movies, and television. With so much awesome clustered in one place, how could The Escapist not stop by? We're heading to the Big Apple - and we're bringing the cast from Doraleous & Associates and Zak Smith from I Hit it With My Axe along for the ride. We will also be meeting famed astrologist, Constance Stellas, at NYCC. Check the schedules below to find out when and where you can see The Escapist stars, live and up-close. Prizes, Prizes and More Prizes! We also have tons of prizes to give away at the show for attendees who also Tweet and Facebook about us. 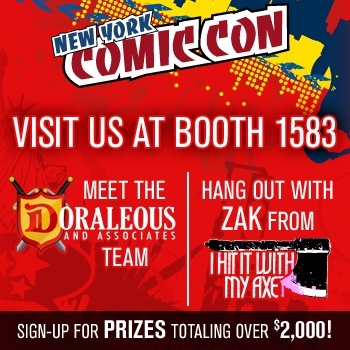 Head over to Booth #1583 for more details on how to win! Origin PC has donated 3 World of Warcraft headsets and an Origin PC Messenger bag. Sideshow Collectibles has donated 150 DVDs and six 12" Anakin Skywalker figures and Dark Horse Comics has donated copies of Yahtzee Croshaw's novel Mogworld! Where Is New York Comic Con? New York Comic Con is held at the Jacob K. Javits Center in Midtown Manhattan. The Javits Center is located at 655 West 34th Street. See the Travel page for directions and information about New York City's buses and subways.